Symbologist Robert Langdon is asked to come to Vatican city to help solve at deadly threat that imposes the Catholic Church and Rome. The presiding Pope has just died and while the Conclave of Cardinals meet to select the next Pope, Langdon must race to unlock the mysteries of the Illuminati and an ancient threat made against the Catholic Church. The threat is only heightened due to the fact that thousands congregate in St. Peter's Square awaiting the announcement of a new Pope. Director Ron Howard and actor Tom Hanks return in the prequel story following Havard University Symbologist Robert Langdon as he uncovers a deadly threat aimed against the Catholic Church in "Angels & Demons." Unfortunately "Angels & Demons" fails to evoke the same intensity The Da Vinci Code had, resulting in the clues being way too easy to decipher, ultimately making the film anticlimatic and less engaging than it's predecessor. "Angels & Demons" was adapted well enough from the book by David Koepp and Akiva Goldsman however, watching Langdon uncover the mystery isn't nearly as enjoyable as the last time around. Most of this can be blamed from the original source. In The Da Vinci Code, the messages Langdon deciphered were incredible, although here in "Angels & Demons" Langdon see's an angel statue pointing west and that means let's go west. Esentially the story is far less engrossing and much easier to decode than the second novel in the series. Furthermore, early on in "Angesl & Demons" Langdon reads a poem that holds the key to the entire mystery, I myself caught on to it immediately and had to suffer through the film to only reassure what I intially decoded. The performances in "Angels & Demons" really do help to keep the viewers attention despite the less-engaging story. Tom Hanks is a perfect Robert Langdon and seems at ease in his role this time around. Hanks is also given a bit more action in the prequel story and the acclaimed actor handles it flawlessly. Ewan McGregor is very good as Camerlengo Patrick McKenna, although here too, his character development is pretty predictable. Ayelet Zurer plays Vittoria Vetra, Langdon's accomplice uncovering the Illuminati's threat and while she is given little to do, she carries her scenes quite well next to such a talented actor as Hanks. Stellan Skarsgård, who is also a phenominal actor, felt a bit under-used and is also way too obvious of a character to read. Lastly I enjoyed Armin Mueller-Stahl's performance as Cardinal Strauss, but I did find it distracting (or dripping of irony) that he just finished playing a Russian mafioso in Eastern Promises and now he is playing a Cardinal for the Catholic Church. The cinematography utilized throughout "Angels & Demons" is stunning. Salvatore Totino, who also did The Da Vinci Code, did a fantastic job of bringing Rome, it's wonderful churches and the Vatican city to life with his thrilling camera work. Totino's work really does add a level of thrill to an otherwise monotonous film. Luckily the pacing to "Angels & Demons" is great and the 138 minute film doesn't feel at all sluggish. I couldn't imagine that I would have been able to sit through the entire film otherwise. 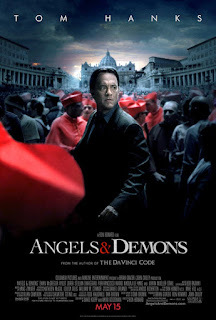 Despite "Angels & Demons" being overly predictable and just not as intriguing as The Da Vinci Code, the performance of Hanks and the keen eye of cinematographer Salvatore Totino help to make the film worth a watch. It is not to say that "Angels & Demons" isn't entertaining, because it is, however the story is no where near as grandiose as its predecessor and ultimately not as thrilling.